Situated in the South Atlantic, some 500 km from mainland South America, the Falkland Islands are a remote archipelago formed from two larger islands (East and West Falkland) and over 700 smaller islands. The islands cover a total area of approximately 12,200 km2 and experience a cool temperate oceanic climate that is characterised by its lack of extremes. Temperatures are never high but are maintained at a moderate level with a mean for January of 9.4 ºC and a mean for July of 2.2 ºC. Rainfall is low. A mean annual precipitation of 640 mm was recorded at Stanley on the east of East Falkland during the period 1944-1978. The topography of the Islands is generally hilly, with the highest point being Mt. Usborne on East Falkland, which stands at 705 m above sea level. The archipelago is almost entirely composed of Palaeozoic and Mesozoic sediments. Soil typically comprises a shallow peaty horizon over a silty-clay sub-soil. Mineral soils arise where sites have become eroded, such as mountaintops and in coastal areas. Soil pH ranges between 4.1 to 5.0. 432 species have so far been recorded growing wild in the Falkland Islands. Of these, 181 species (including a natural hybrid) are native. The Falkland Islands are currently considered to have fourteen endemic species. These are: lady's slipper Calceolaria fothergillii (Scrophulariaceae), clubmoss cudweed Chevreulia lycopodioides (Asteraceae), hairy daisy Erigeron incertus (Asteraceae), Antarctic cudweed Gamochaeta antarctica (Asteraceae), silvery buttercup Hamadryas argentea (Ranunculaceae), vanilla daisy Leucheria suaveolens (Asteraceae), Falklands Nassauvia Nassauvia falklandica, coastal Nassauvia Nassauvia gaudichaudii (Asteraceae), snake plant Nassauvia serpens (Asteraceae), false plantain Nastanthus falklandicus (Calyceraceae), Falkland rock-cress Phlebolobium maclovianum (Brassicaceae), Moore's plantain Plantago moorei (Plantaginaceae), Senecio littoralis and Senecio vaginatus (Asteraceae). Nastanthus falklandicus and Plantago moorei are of particular note as they appear to be narrow-endemics, so far having only been recorded in the south-west of the Islands. 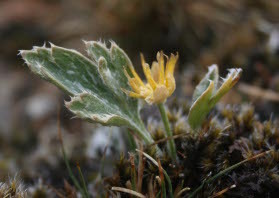 There are two near endemic species occurring in the Falklands, the Falkland cudweed Gamochaeta malvinensis (Asteraceae) and shield fern Polystichum mohrioides (Dryopteridaceae). 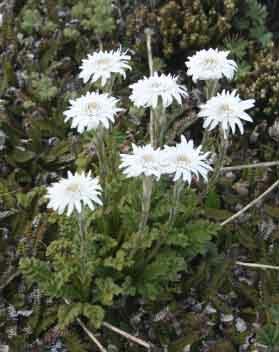 Gamochaeta malvinensis is thought to be restricted to the Falkland Islands, Staten Island and Peninsular Mitre, the easternmost part of Isla Grande de Tierra del Fuego. Polystichum mohrioides is restricted to the Falkland Islands and South Georgia. The Falkland Islands population of Tussac-grass Poa flabellata most likely contains at least 20% of the world population. Most of the Falkland Islands are covered by acid grasslands (dominated by white grass Cortaderia pilosa (Poaceae)) and dwarf shrub heath (dominated by diddle-dee Empetrum rubrum (Ericaceae)). Cortaderia pilosa -dominated acid grassland can develop on most non-swampy ground and is widespread on ground below 100 m as well as being common on gentler slopes up to c. 200 m above sea level. Dwarf shrub heath communities form on comparatively dry ground, most developed on rocky ridges or other places where the immediate subsoil is relatively coarse and so free-draining. Empetrum rubrum is usually the dominant species however Christmas bush Baccharis magellanica (Asteraceae) and Gaultheria species can also be locally dominant or co-dominant as can the cushion-forming Balsam bog Bolax gummifera (Apiaceae). Three of the globally threatened endemics Erigeron incertus, G. antarctica and the cushion-forming P. moorei appear to be predominantly if not entirely restricted to Empetrum rubrum dwarf shrub heath. The Falkland Islands lack an indigenous tree cover, however, native scrub habitats, dominated by Fachine Chiliotrichum diffusum (Asteraceae) or native boxwood Hebe elliptica (Scrophulariaceae) do occur. Fachine scrub forms in reasonably drained mesic environments, with denser stands often forming an association with small fern Blechnum penna-marina (Blechnaceae) and Gunnera magellanica as the main ground cover. Fachine scrub has been found to grow in association with the endemic Hamadryas argentea at three sites and with the endemic Nassauvia serpens at four sites. At one site Fachine also forms an association with the scarce Coral Fern, Gleichenia cryptocarpa. Native Boxwood scrub appears to be restricted to the western and northern coasts of West Falkland. There are very few sites across the islands which include significant stands of native scrub areas. Non-native scrub habitats can also be found on the Falklands, formed from introduced gorse Ulex europaeus (Fabaceae) or calafate Berberis buxifolia (Berberidaceae). Large areas of the Falklands are covered in stone-runs which form dramatic patterns across the landscape. 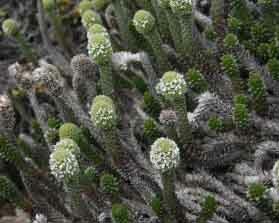 The endemic Snake Plant, Nassauvia serpens and an array of fern species, including several delicate filmy ferns (e.g. the Falkland filmy-fern Hymenophyllum falklandicum and the twisted filmy-fern Hymenophyllum tortuosum) as well as the sculptural near endemic Polystichum mohrioides can be found growing within areas of inland rock. Tussac is one of the most striking habitats to be found in the Falklands and is formed from almost pure stands of Poa flabellata which attain heights of 2-3 m, with individual stocks of up to 1.5 m in diameter. Tussac grounds are confined to coastal areas on the mainland islands and small offshore islands, usually below 200 m. On maritime rocks, shingle, cliff and slopes above the high water mark, areas are influenced by wave-splash and sea-spray. 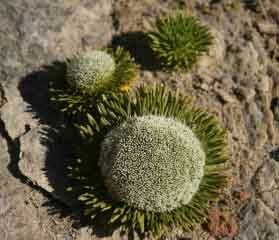 These types of vegetation are associated with nutrient input from seabird colonies, particularly penguin rookeries. Rarer species include the delicately beautiful maidenhair fern Adiantum chilense (Adiantaceae), Fuegian whitlowgrass Draba magellanica (Brassicaceae) and the skullcap Scutellaria nummulariifolia (Lamiaceae). Saltmarsh in the Falkland Islands is typified by extensive mats of thrift plantain Plantago barbata (Plantaginaceae) or shore meadow-grass Poa robusta (Poaceae). 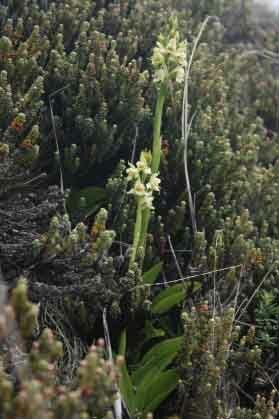 The restricted range endemic Nastanthus falklandicus appears to be consistently associated with coastal- Poa robusta- Apium australe-Emerald-bog Colobanthus subulatus vegetation on sandy maritime slope habitats. 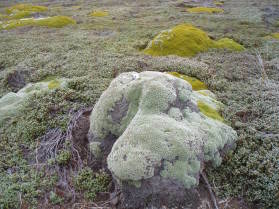 Mountain summit vegetation is dominated by a range of cushion plants, moss and lichen dominated heaths. Typical cushion plants in this zone are Bolax gummifera, cushion-plant Azorella selago (Apiaceae), clubmoss azorella Azorella lycopodioides (Apiaceae), Colobanthus subulatus, valerian-bog Valeriana sedifolia (Valarianaceae) and notched moss-bog Abrotanella emarginata (Asteraceae). Fresh-water vegetation is most frequently characterized by vegetation dominated by either spike-rush Eleocharis melanostachys (Cyperaceae) or water-milfoil Myriophyllum quitense (Haloragaceae). A new record for the scarce native pondweed Potamogeton linguatus (Potamogetonaceae) was made during the latest survey. Areas of bog are generally dominated by soft-camp bog, Astelia pumila (Asteliaceae) with associated species including the carnivorous sundew Drosera uniflora (Droseraceae), dwarf marigold Caltha appendiculata (Ranunculaceae) and gaimardia Gaimardia australis (Centrolepidaceae). 23 species are currently recognised as nationally threatened, five of which (all endemics), are also considered globally threatened. The present Red List, however, is incomplete and is in need of revision as large areas of the Falklands still remain un-surveyed and some records lack detailed population data or may now be out of date. Agriculture: the unsustainable management of sheep (introduced in the 1860s) is widely cited as a cause for the decline in many taxa in the Falklands. This is owing to the over-stocking of sheep and loss/degradation of important habitats caused by burning, erosion, re-seeding using introduced European forage species, competition from introduced grasses and the application of fertilisers. Human disturbance: greatest wherever human populations are highest these threats include recreational land-use and vehicle damage. Chance natural events. Small, isolated, populations are inherently vulnerable to chance natural events, for example the risk of fire from lightening strikes is relatively high on small islands within the archipelago. Genetic erosion: this factor may be severely affecting populations of all threatened plant species by altering their genetic structure and by reducing genetic diversity. This provides one justification for the seed collecting which is currently taking place in the Falklands in collaboration with the Millennium Seed Bank. Invasive species: some introduced plant species have the ability to become invasive and out-compete the native flora, thereby posing a serious threat. The introduced plant species assessed as having the most potential for becoming invasive are calafate Berberis buxifolia, gorse Ulex europaeus, broom Cytisus scoparius, Darwin's barberry Berberis darwinii, European ragwort Senecio jacobea, Oxford ragwort Senecio squalidus, creeping/ Californian thistle Cirsium arvense and spear/ Scotch thistle Cirsium vulgare. Kew's UK Overseas Territories team collaborates with the Falklands Conservation on plant conservation activities. UKOTs Online Herbarium - Falkland Islands (Current Year). Facilitated by the Royal Botanic Gardens, Kew. Hamilton, M.A., Heller, T.M. and Barrios, S. (eds.). Published on the internet at http://brahmsonline.kew.org/falklands (Date Accessed).